Are your hens laying more eggs than you know how to eat? Well, then… you need these Broccoli and Cheddar Egg Puffs! But wait, there's more… These egg puffs are both keto- and Trim Healthy Mama-friendly, too! I tried a recipe for Irish Scrambled Eggs recently. First I melted butter in a skillet, then added heavy cream and waited until both were warm. Finally, I added my whisked eggs and stirred as they cooked. Seriously, they were the most amazing scrambled eggs I'd ever had! And just like that, I knew I had to find a way to get that rich, delicious flavor into egg puffs. The solution? Combine melted butter and heavy cream into the egg mixture. Voila! Delectable egg puffs brimming with healthy fats. Bonus: everyone in the family can enjoy them! From little ones to Trim Healthy Mama to keto dieters, egg puffs are a perfect meal choice. Feeling like some meat? Throw some cooked sausage crumbles, chopped crispy bacon, leftover beef roast, diced cooked chicken, or flaked cooked salmon into the mix! Just be sure to choose pasture-raised or wild-caught meat that is free of nitrates. Finally, these protein-packed puffs are delicious cold, too! Pack them as a picnic lunch or keep them in the fridge for a quick snack. 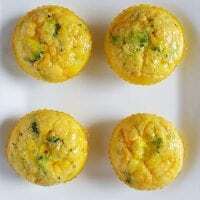 If you make them in mini silicone muffin liners or a mini muffin pan, they're perfect for littles. Need a low-carb or Trim Healthy Mama S breakfast or snack that's ALSO kid-approved? 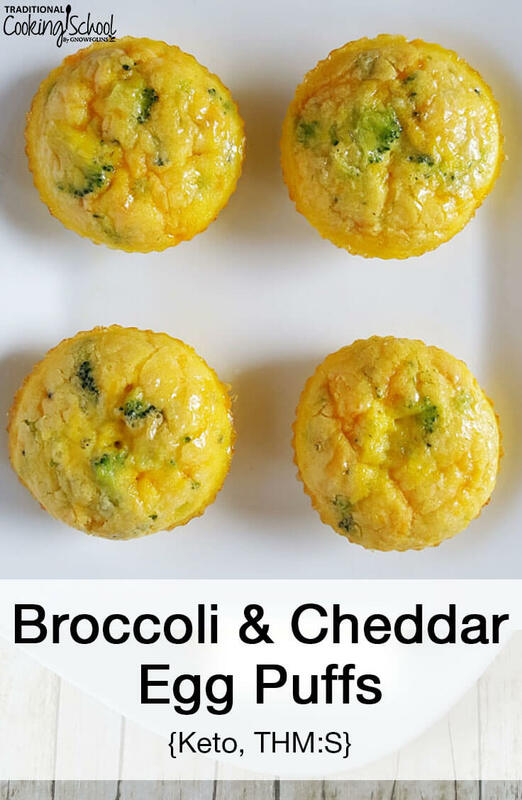 These Keto Broccoli & Cheddar Egg Puffs tick all the boxes! They're easy, portable, full of healthy fats, and great for the whole family. savory add-ins such as: leftover chopped cooked meats bacon, sausage, mushrooms, asparagus, peppers, kale, spinach, fresh herbs, etc. If using a muffin pan, grease well. Or set out silicone muffin liners. Whisk eggs in a mixing bowl. Add melted butter. Whisk well. Add heavy cream. Whisk well. Add nutritional yeast, garlic powder, sea salt, and Dijon mustard. Whisk well. Add cheese and broccoli (or other add-ins). Stir to combine. Fill muffin cups or liners 3/4 full. Bake for 25 to 30 minutes, or until set and tops lightly browned. Enjoy! *Room temperature eggs will help keep the melted butter from solidifying when you whisk the two together. *If using additional ingredients, you may end up with more than 12 egg puffs. Have you ever made egg puffs? What are your favorite additions? Christy, I have not personally made these, but I’m thinking you could substitute full fat coconut milk or coconut cream for the heavy cream that is called for in the recipe. You could substitute with anything really. Sometimes I even use water! The heavy cream makes them very delicious, but they are still good made with almond milk or other non-dairy milks. I’m not sure how well coconut milk will work flavor-wise but you could certainly try it! As a butter replacement, I would try red palm oil myself. I love cooking eggs in red palm oil and it would also help to lend that richness that would be missing by not using cream. Yes, you can leave out the nutritional yeast. These look yummy, but I have never used nutritional yeast before. What purpose does it serve (flavor? leavening? etc.)? Is there a valid substitute, since I don’t have it in my kitchen, or do I need to go buy it if I want to try these? Is a super food flavoring and parmesan can be used as a substitute. Wardee, I have the same question as the lady previous to my comment. What is the purpose of the nutritional yeast and what can be substitute if I do not have it, I love to learn more about this ingredient so that I can use it more often with other recipes. I add nutritional yeast for a bit of extra protein, the B vitamins, and the flavor. It has a nutty/cheesy kind of flavor and I just love it. 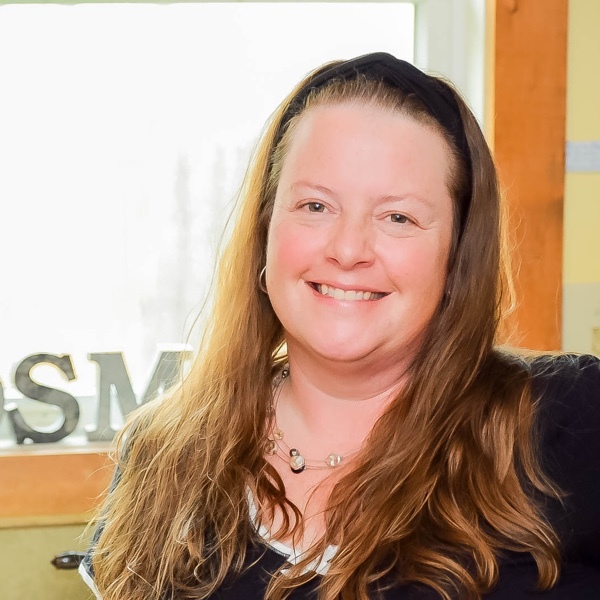 I have recently read this article here on TCS about nutritional yeast which has made me reconsider the brands I’ve used in the past: https://traditionalcookingschool.com/health-and-nutrition/healthy-living-health-and-nutrition/why-nutritional-yeast-is-not-vegan-health-food/ If you have certain issues it may not be the best thing to use and right now I’m informally conducting some experiments to see if we should continue using it. Most of the time I buy it in bulk at local health food stores but I don’t know the brand they carry so I plan on giving them a call to find out. All that said, you can certainly leave out the nutritional yeast if you want to, it’s purely for a bit of additional nutrition and flavor. These sound like a winner when traveling. Have you tried freezing them to extend the food safety? Will they freeze reasonably well? Yes they are great for traveling. I have not tried freezing them though (they never last long enough to make it there lol). If you have ever frozen egg dishes before and they turn out fine then I would imagine these would too. I’ll have to give it a try (if my kiddos will let me, they sure do love them). These are delicious!! I had some cream that was expiring soon, so this recipe was a wonderful way to utilize the heavy cream while prepping ahead for yummy healthy breakfast. I used all pecorino cheese because it’s what I had on hand.